Over the years, clients and potential homebuyers have turned to us for help determining if a particular house has the potential to meet their needs. They want to know if the house has "good bones". We've all heard the term, but what does it actually mean? Quality construction - A house with good bones is well-built. I "walk" a building looking for fundamental structural problems. How does it feel? Does it bounce or list, or does it "feel" solid? I look for cracks above doorways or in stairways. Are things tight? When I go to the basement, I look along the bottoms of the floor joists. Do they seem to be in a flat plane or do they sag in the middle of their span? Are the joists notched into the sill or resting on their full depth? Can you see cracks between the ends and the sill or are they still tight? When looking down along the foundation wall, does it look plumb or is it listing outward? When outside the building and stepping back looking at it, do the walls have bows or are they straight? Does the house lean to one side or the other? Does the roof of the front porch sag? Are there sways to the roof or is it in one plane? Solid infrastructure - It's relatively simple to replace aging roofing shingles or update plumbing fixtures, but it is far more complicated if the basic infrastructure of the home is lacking. If the foundation, roof, heating, plumbing and electrical systems are in good shape, renovations become much easier. Good floor plan – Is there good flow between frequently used rooms? Are rooms arranged logically? Look at how traffic travels through the house as a whole. You can renovate to make particular rooms more livable, but it is far more costly and complex to make fundamental changes because the entire home’s floor plan just does not work. If a floor plan feels awkward, try to envision the space with walls moved or taken down entirely. We recently worked on a center entrance colonial in which the small dining room and kitchen made the entire first floor feel disjointed and tiny. By removing the walls between the dining room and kitchen, and the dining room and hallway, we created a sense of spaciousness without changing the footprint of the house. Well-proportioned rooms – Are the home’s rooms a useful size and shape, or can they be easily changed? Many older homes have small rooms that are unsuited to modern lifestyles. It is often possible, however, to move walls and open up spaces relatively easily. Removing walls, adding a beam and creating an open a floor plan can make a separate kitchen, dining room and living room a great entertainment area or family space. On the other hand, sometimes there are fundamental problems that are not easy to correct. When I recently toured a newly renovated condo, I was surprised that I had to duck at the last step when entering the third floor master suite. The walls sloped so steeply that the “walk in closet” had almost no useable space. The room’s underlying structure was so limiting that it would have been very expensive to create space that worked better for the homeowners. 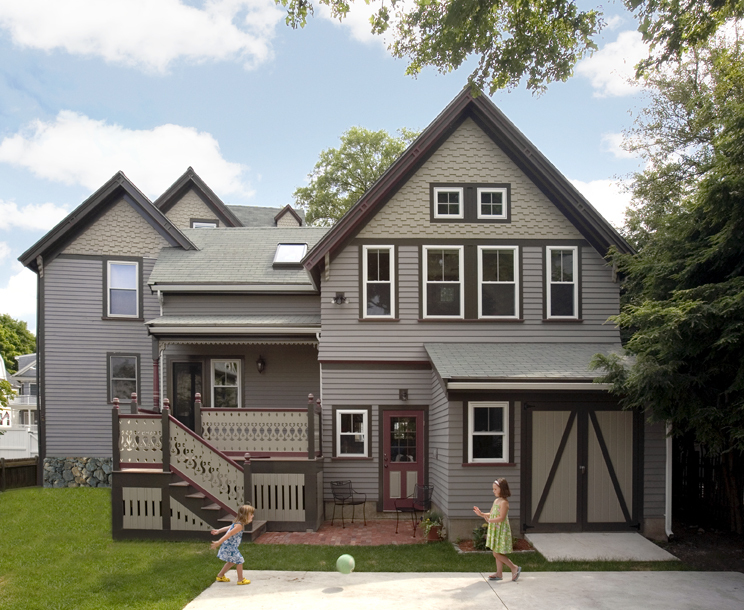 Character -- Houses with good bones have a personality. They don’t look like they were stamped out by a developer with a cookie-cutter. Sometimes even the quirkiest architectural detail can be used to advantage to create a fascinating focal point. In one Cambridge home, we took a steep attic stairway and added a skylight and delightful handrailing to create an eye-catching, artistic feature that doubled as a welcoming entrance to a nanny’s bedroom and owner’s office. Natural light – A sunny, airy home feels happier and more spacious, but don’t automatically give up on a house because it is dark. Consider small changes that could bring in more light. We’ve added skylights, transom windows and even cut openings in walls and floors to help light spread throughout a home. Does your house have good bones? We can help you decide whether renovating or adding on to your home makes sense. Contact us to arrange an appointment!